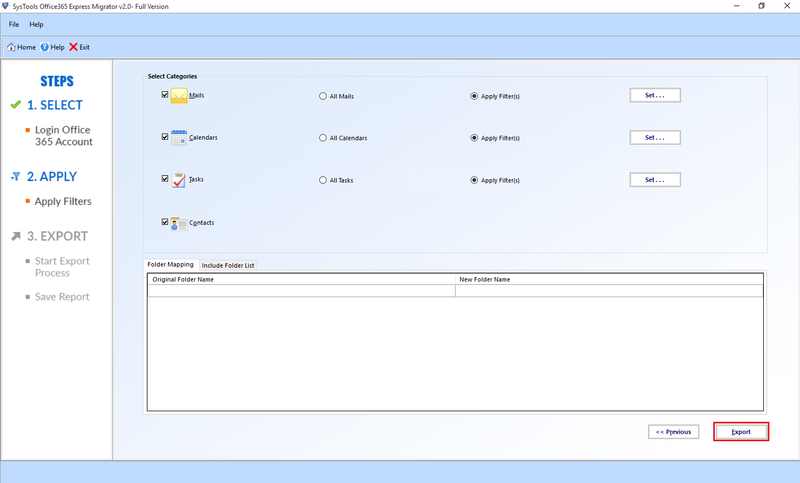 Office 365 to Office 365 Migrator Tool has simple GUI. Supports migration of Emails, Contacts, Calendars and Tasks. Imports CSV file to add source and destination account credentials. Email Filter and Check Duplicate Emails options for migration. 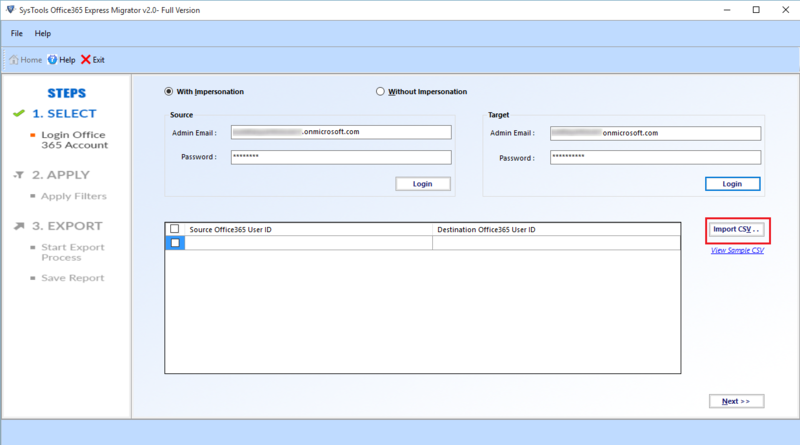 Mailbox Authentication for migrating from source to destination. 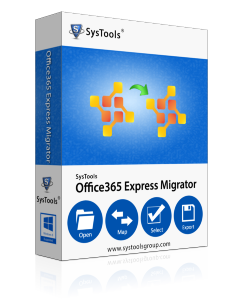 Free Demo edition of Office 365 Express Migrator software allows to migrate 100 emails & 25 other items per folder from one Office 365 to another Office 365 tenant / account. The Office 365 Express Migrator Tool allow user to convert Emails, Contacts, Calendars, Tasks & shared mailbox from one Office 365 account to another Office 365 account. After mapping from source to destination mailbox, the software will authenticate every mailbox and start the O365 to O365 migration. The Mailbox authentication progress can be checked in the status window after clicking export. The Migration software allows user to check presence of duplicate emails by selecting Check Duplicate Email option while migrating emails from one Office 365 account to another Office 365 account. The Office 365 to Office 365 Migration tool has option to check/ uncheck the desired selective mails, contacts, calendars and tasks that user wish to export from one Office 365 account to another Office 365 account. The software transfers domain from Office 365 to office 365 account allowing user to export only the emails residing on and between the specified date ranges with the help of Email Filter. The tool provides Mailbox mapping option that let user map and migrate all the data items from source Office 365 account to destination Office 365 account using the CSV file containing both account credentials. The tool migrate email from Office 365 to 365 account and will generate the final report containing the details of items converted like Name of the mailbox, count of mails, contacts, calendars, tasks and time taken for migration. 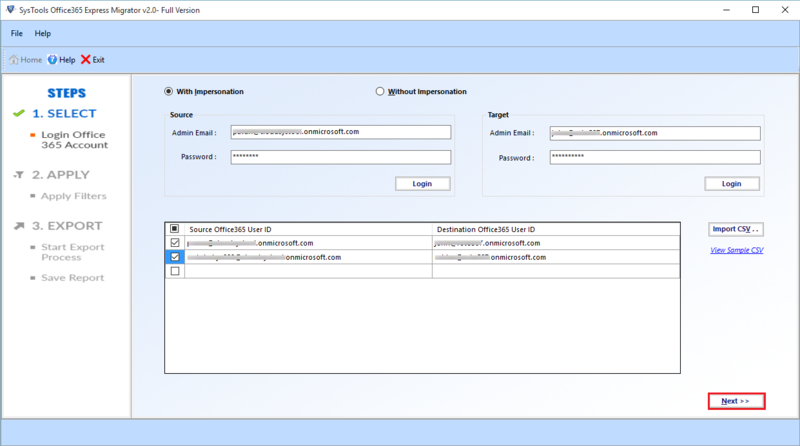 The Migration tool provides option to add CSV file containing multiple Office 365 account credentials i.e. username and password for both source and destination instead of adding them manually one by one. Step 2 : Click on Import CSV Button. Step 3 : Enter logins of users mailboxes. Step 4 : Select Category and Email filter and then click Export . Can I migrate multiple Office 365 mailboxes to another Office 365 account at a time using this tool? Yes, the tool allows you to migrate Office 365 to another Office 365 account by adding CSV file containing multiple source and destination account credentials i.e. both the username and password. Does the software explain steps on how to migrate Office 365 to Office 365 account? Yes, the easy to use interface provided by the software gives the systematic procedure to Migrate Office 365 to another Office 365 account for effortless migration process of the mailbox items. Can I migrate only the desired mailbox item from one Office 365 account to another account? Yes, the migration software will allow you to check/uncheck to select the desired mailbox items for migration from one Office 365 account to another Office 365 account. Will the Office 365 Express Migrator software work on my Windows 8.1 machine? Yes, Office 365 to Office 365 migration software will work on almost all the versions of Windows system including 8.1 and all the lower versions for the mailbox migration. I have huge number of emails in my Office 365 account. Can I filter and export only the mails that I need using the tool? The migration tool provides Email Filter option that allow user to migrate only the mails residing on and between the date ranges specifying 'from' and 'to' dates to export only the selected mails. 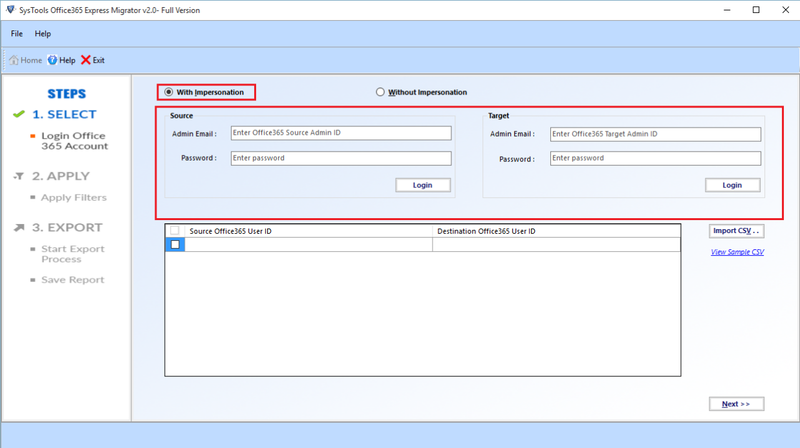 Will the migration tool help me in removing duplicate emails present in both source and destination Office 365 accounts? Yes, the migration tool provides feature to remove duplicate emails by selecting Check Duplicate Email option while migrating emails from one Office 365 account to another Office 365 account. "Due to unnecessary spam emails that I received daily in my old Office 365 account, I wanted to migrate all the emails, tasks, calendars and tasks from that Office 365 account to a new Office 365 account. The Office 365 Express migrator tool helped me to migrate Office 365 to another Office 365 account." "As I was using one Office 365 account for both official and personal use, I wanted to migrate the emails exchanged on year 2013 to another Office 365 account which became really easy with the help of Email Filter feature provided by the Office 365 Express Migration tool." "I would like to thank my office colleague that has recommended me to use this software. The easy to use interface provided by the tool has helped me to easily migrate Office 365 to another Office 365 account including all emails, contacts, calendars, and tasks." Copyright © 2015 – 2018 Mailbakup™ . All rights reserved.